It seems that Spring has finally sprung in London! 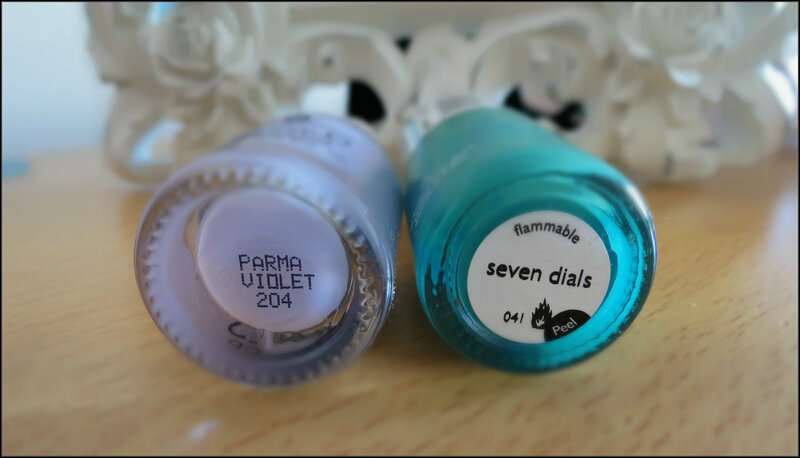 The green shade is Seven Dials from Nails Inc. Nails Inc are my favourite makers of nail polish – the formula is just stunning! With two coats you get a perfectly smooth, shiny and glossy nail, which once completed with a top and base coat will last for about a week without chipping – perfect to wear during the working week! Nails Inc have a huge range of colours and effects available on their website and they often have sales and offers popping up – for example this week you could get 7 lucky dip nail polishes for £18 – bargain! So if you haven’t checked out Nails Inc I would highly recommend it! The lilac shade is Parma Violet from Topshop. Topshop make up is great – I love it all but the nail varnishes are brilliant. At only £5 each they are super cheap. They don’t last as long as the Nails Inc ones and I needed three coats of the lilac to match up to the vibrant pastel green. However, the selection of shades is brilliant and perfect for polish you only need on for a few days. Check them out on the Topshop website. As for my top coat and base coat I use Save the Nail and Sally Hansen’s Insta-Dri which is AMAZING! Such a good top coat – I cannot recommend it enough. It makes your nails look like they’ve been professionally done and, as the name suggests, it dries so quickly! 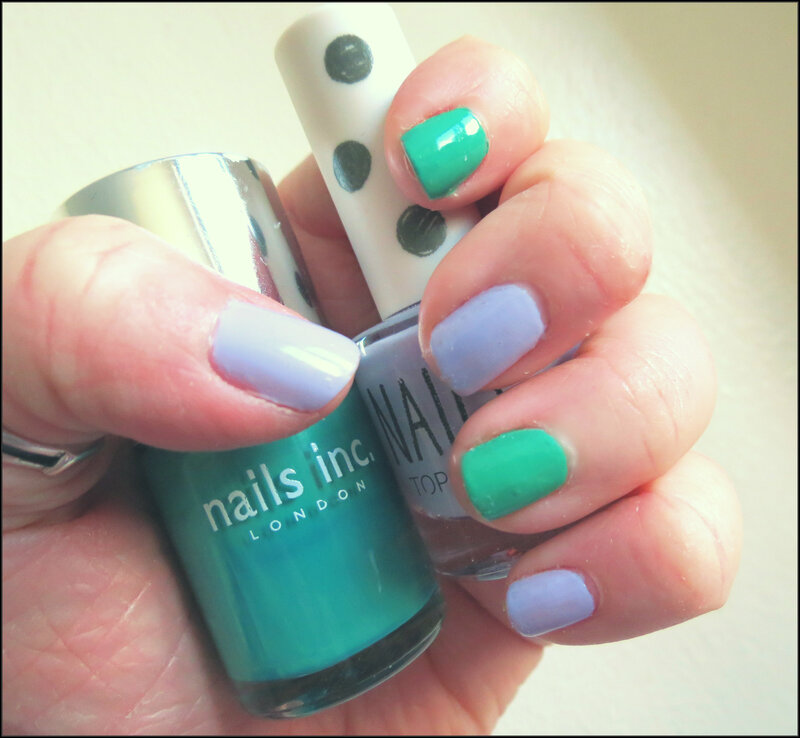 What are your favourite colour nails for Spring? Which is your favourite brand of nail polish? Leave links and comments below as I’d love to have a read! Topshop lipsticks are lovely! I recently bought the shade Innocent from Topshop and I completely love it. I have never been one for wearing a lot of lipstick or lipgloss – I usually just stick with Vaseline to give a nice sheen to my lips. This is because I like my eyes, I think they are my best feature so I try to accentuate them as much as possible. (I have an unhealthy obsession with Mac eyeshadow which will prove this point.) But recently I’ve been trying more and more lipstick and I’ve found a beauty in the Topshop range. I think this shade is gorgeous – it suits my skin tone and I just love the colour. The colour goes on beautifully and considering how much it is I think this is great value for money for such a quality product. It doesn’t dry my lips out and it lasts for a long time on my lips – perfect for when you’re dashing about with little time to reapply your lippy! Yay for Topshop lipstick. Have you tried the Topshop lipsticks? Do you love them as much as I do? What is your favourite brand of lipstick? Leave comments and links below as I love having a read!